Among the celebrity babies social media is obsessed with these days, actors Soha Ali Khan and Kunal Kemmu's daughter Inaaya is one. The nine-month-old already has a fan following of her own - her pictures often send Instagram into meltdown mode. The little baby has won the hearts of many and it seems among them is none other than India's star woman cricketer Mithali Raj. The ace sports woman sent across a heartwarming gift for Inaaya recently. But her message along with the gift makes it all the more special. 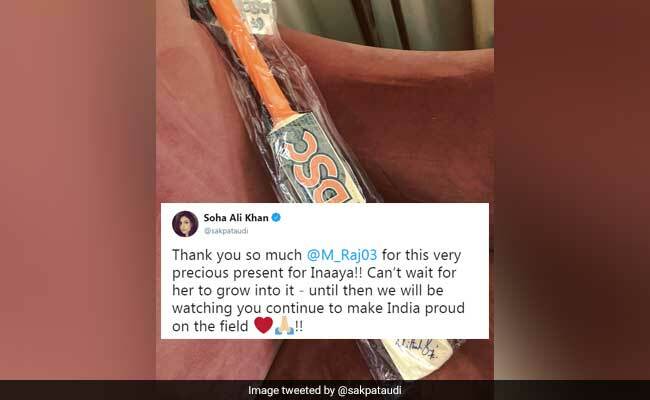 In a tweet posted yesterday, Soha thanked Mithali for the adorable present. "Thank you so much @M_Raj03 for this very precious present for Inaaya!! Can't wait for her to grow into it..." she wrote on Twitter. The tweet is accompanied with a picture of the gift - a bat autographed by Mithali. The cricketer also wrote an uplifting message for little Inaaya. "To Inaaya, it's never too early to start..." says the message on the bat. Isn't that just delightful? Mithali even replied to Soha's tweet somewhat explaining her reason for the gift. Inaaya is the granddaughter of legendary cricketer Mansoor Ali Khan Pataudi (popularly known as Tiger Pataudi) considered as one of the most successful Indian captains. The heartwarming message has touched a chord with thousands on Twitter. "A sweet gesture..." says one Twitter user. "Thoughtful gift," tweets another. "This is amazing," posts a third. Guess we can expect great things from little Inaaya in the future.